Photos for this article courtesy of Georg Pfeiffer. Visit his Cadillac site at www.1959eldorado.at. If there is one word to describe the automotive styling of the 1950's, the word would be excess," excess chrome, excess gadgetry and, of course, excess use of fins! Some would argue that any fins at all constitute excess and, although they performed no real function, history has left us with Chryslers, Fords, Chevys, Buicks, Pontiacs and many, many others that sported fins. When it comes to the biggest, tallest and most ornate fins, the hands-down winner of all time is the 1959 Cadillac. No car's tailfins anywhere, anytime, achieved the height (excuse the pun) of absurdity approaching that of the Cadillac's gigantic tapered fins. Those guys were tall (nearly the height of the car! ), capped at the rear with a chrome edge and were fitted with twin, bullet-shaped nacelles in which were housed the tail lights. How did this come about? It's only fitting that the '59 Caddy ended the era of fins in such a big way. 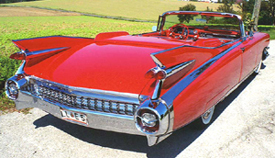 It was Cadillac that started the use of fins in the first place. During WW II, the P38 "Lightning" fighter plane was earning its reputation for enemy kills more than perhaps any other airplane. The twin-boom, twin-tail plane was powered by two GM Allison V12 engines. Some of GM's corporate executives, including Harley Earl, GM's vice president for styling, saw the airplane prior to its acceptance by the military. He fell in love with the finned tail booms and ordered his designers to mimic that effect on the 1948 Cadillac. Nothing brings people into showrooms like convertibles. Everybody likes the free-spirited, open air look of a ragtop and dealers have known this for decades. They also know that relatively few people actually purchase convertibles, instead usually opting for something more practical. That fact notwithstanding, you'll never see a showroom without a convertible unless that brand doesn't offer one. Cadillac always offered convertibles, and in 1959 there was no equal to the Cadillac. It was an imposing car in every way. At nearly 19 feet in length and almost 7 feet in width, it was a monster. The Caddy weighed in at 5,060 pounds, had a wheelbase of 130 inches and rode on 8.20X15 tires (enormous for the day). The car came standard with HydraMatic transmission, power steering and power brakes and offered one of the largest selections of options then available: air conditioning, cruise control, tinted glass and automatic headlight dimmer, to name but a few. Most of the production run of Cadillac convertibles were what the division called the Series 62. The Series 62 convertible (called the Eldorado) sold for $5,455. Those who wished for a little something more upscale, however, could choose a Series 64 Cadillac convertible called the Biarritz. This was a more Lavishly-equipped model which, in past years, had been an entirely different car with its own styling and dimensions. For $7,401 the well-monied set could buy a 1959 Eldorado Biarritz convertible and really impress their friends. What they got for the money was an impressive list of standard features including the usual power-assist stuff, air suspension, electric door locks, remote trunk lid, fog lamps, electric clock, 4 cigarette lighters, back-up lights, courtesy and map lights, 3-way rearview mirror (no, we haven't any idea what that was!) and about 20 more gadgets. There were enough chrome-plated knobs and handles and trim pieces to build another car. Under the hood the Biarritz owner got what Cadillac called its "Q" engine, a triple two-barrel carburetor version of the base 390 cubic-inch engine, which put out 345 horsepower and 435 lbft of torque. On the outside, the Biarritz let you know it was a more expensive car than the Series 62 with the addition of a chrome beltline spear that went from the rear bumper to the windshield. If that weren't enough, there were chromed letters (that spelled ELDORADO) stuck along the lower edge of the front fender. Overall, the Eldo-Biarritz convertible was sort of graceful in spite of its nearly 300 pounds of chromed bumpers, headlight pods, dual turn signal nacelles, "jet exhaust" rear bumpers and assorted trim. Excess, thy name is Cadillac! Today the '59 Cadillac convertibles are one of the most sought-after collector cars. Even those who hated the styling of the 50's love the Caddy convertibles. These gaudy, unsubtle, uneconomical, sloppy-handling and impossible-to-park cars symbolize an era when most people were carefree and optimistic and didn't take life (or worse — themselves!) too seriously. However, buying one these days requires serious money! A model 62 convertible in average, drivable condition will set you back $24,500. A Biarritz convertible in the same condition is worth $32,000 and a fully-restored example goes for double that amount.